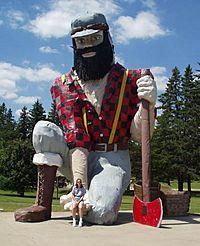 Paul Bunyan in Akeley, Minnesota. A folk hero is a person, who may or may not have existed, and is famous and well liked by people, or people of a certain country. Usually it is someone who helped the common people or fought against the authorities, such as a bad king. People tells stories about folk heroes, most of their stories have been passed down orally, and changed to fit the situations. They usually have a special skill or trait of some sort (Paul Bunyan is very tall). Davy Crockett, famous American folk hero who died at the Battle of the Alamo. Jim Bowie, famous for his Bowie knife, died at the Battle of the Alamo. Qutb Shah, supposed Arab-Afghan who conquered large parts of Northern India and sired many tribes. Dulla Bhatti who was a popular resistance hero against the Mughal Empire. Rai Ahmad Khan Kharal who was a Punjabi freedom-fighter in 1857. Folk hero Facts for Kids. Kiddle Encyclopedia.